Baron Fig sent me a sample of their newest product, the card sleeve, to review here on the blog. As usual all thoughts shared are my own. 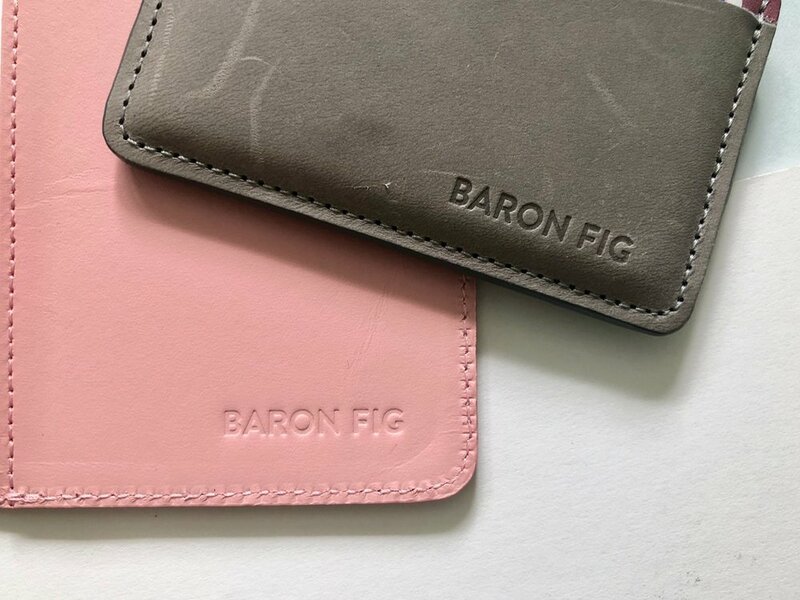 In the past few weeks Baron Fig launched the latest addition to their product offering, a leather card sleeve expanding the number of leather goods they have to offer. The card sleeve is a very simple, slim wallet. It comes in a range of the signature Baron Fig colours, Fig Wine, Yellowgold, Charcoal and Rose Quartz. I have a Fig Wine card sleeve which I have been using for a few weeks. The card sleeves packaging is really nice and simple. It arrives in a card envelope with a familiar line drawing of the item on the outside. The sleeve is wrapped in tissue paper protecting the leather. The card sleeve is very minimal. I actually use a card holder normally which over time has expanded with all the cards I cram into it. This had two card sections on each side and then an opening in the middle allowing me to carry more than 10 cards and some cash. The Baron Fig card sleeve forces you to minimise what you’re carrying. There is one opening on either side, the main one having a diagonal cut off giving you easy access to the card(s) you use the most. It also adds something different to the design and shows off some of that Fig Wine colour. The colouring on the Fig Wine and Yellowgold is subtle with most of the card sleeve actually being charcoal and accents of the Baron Fig pallet showing through. The only exception to this is the Rose Quartz which is the inverse and full on pink! Using the card sleeve has been good. You can see there are some scuff marks on the leather due to scratches from my keys, being thrown around in my bag and so on. This doesn’t bother me at all, but does shows that the leather is soft. The number of pockets has taken some personal adjustment reducing down what I carry. I have taken out some cards, which on the whole were loyalty cards or ones I don’t use very often. I have managed to squeeze two cards in one pocket, three in the other and kept the central space for cash. My one criticism of the card sleeve is the size of the Baron Fig logo on the front of the card sleeve. It’s the same size as my pocket Guardian but this is hidden on the inside cover. It would be nice if this was a bit smaller and less visible, but that’s a small niggle I have. I really like the card sleeve and have personally always appreciated a simpler, usually smaller, wallet carry. The Baron Fig card sleeve is a nice slim profile wallet made from the same high quality leather as the other Baron Fig leather goods. Thank you to the guys at Baron Fig for sending me over their card sleeve to review. Pattern Studio offer a range of different products from wrapping paper, greetings cards and even wallpaper! They contacted me to ask if I’d like to test out a sample of their products and although I haven’t reviewed anything like this on the blog before, it fits perfectly into my love of stationery. I was immediately drawn to the different designs used across the range of products on offer. They have big bold patterns using a range of bright colours. My favourite among the samples I received is the jungle leaf design which looks particularly good on the wrapping paper. The quality of Pattern Studios products is very good. The wrapping paper is strong and has a nice matte finish. This is the perfect type of wrapping paper to have on hand for those emergency wrapping scenarios. I also received a couple of greetings cards that have a similar design style to the wrapping paper. Whenever I buy a card for someone I always hesitate on what pen to use and wonder if my fountain pens will bleed and feather. So I decided to test out one of the cards with a few different pens and pencils. These cards have a slight coating on them and it did result in both of my Kaweco fountain pens, albeit with different brands of ink, feathering on this card stock. Other fountain pens held up well and I think those with a firmer nib such as the Lamy LX worked fine. All of the other pens and pencils I tested wrote without issue. Lastly I was sent a pack of three blank A5 notebooks that have a soft cover and feature a few of the different Pattern Studio designs. Because of the cover stock the notebooks are very flimsy and the paper inside is basic reminding me of standard printer paper. I ran a basic pen test to see how the paper inside performed and on the whole it was ok however there is a lot of show through with fountain pens and slight feathering with some of the fountain pens. The gift wrap and greeting cards from Pattern Studio are really great. I like the range of different designs they have on offer from the bold jungle and tropical themes through to the simpler use of shapes and colour. I’m always on the lookout for great gift wrap and cards that are something different to what you may find in stores and Pattern Studio’s products certainly fit this. Disclaimer: Pattern Studio sent me these products free of charge for the purpose of reviewing on the blog. This has not swayed the opinions expressed in this review, if the products aren’t great I will always let you know. I have wanted a label maker for some time. I had been looking at a number of traditional labellers from Dymo, Epson and Casio. I didn’t want anything too big as I wouldn’t use it often and the cost of some of these label makers really put me off buying one. Then I fount the Penco Label Maker on The Stationers website and I immediately snapped one up. This label maker was everything I wanted. It was small, at the right sort of price point and came with black tape. Perfect. Penco is a brand I am growing to love. They have simple great stationery and their label maker is no different. The design of the label maker is very simple, there are no unnecessary parts. The yellow handle is really striking and I love the simple way the tape is attached on the side. You just get to see how this label maker works. It satisfies all my geeky desires. You get two font wheels with the label maker, one uppercase and one lowercase. I have mainly used the lowercase dial as I really like the old type that it uses. To use and print on the tape you simply twist the wheel to the letter you need, push down on the lever and this prints the letter on the tape. There is a build in scissor tool to cut the tape when you’re done. This process is so simple and a lot more satisfying than a digital version. I haven’t really labelled too much, mostly my notebooks. However I did use this at Christmas to make gingerbread cookies that I packaged and added their names with this label maker. I have also organised a few boxes and labelled those. I bought my Penco Label Maker from The Stationer the new online store from Tessa at All Things Stationery. I hadn’t seen a label maker like this anywhere else. I really like the Penco label maker, it is well worth a buy. Washi tape is a fun stationery accessory but also can actually be very useful. Once you buying your first washi tape and play around with it then you find yourself wanting more and more. I have a very small selection of tapes that I have a number of uses for. Today I thought I would share my selection of washi tapes and the ways I use them. I have a handful of different washi tapes. Most of them are MT or Maste branded tapes. I have a range of different colours, some with pretty and fun designs on them — the sumo wrestling tape is a personal favourite. A few of these tapes were sent as gifts, such as the funky pop art tape. My latest washi acquisition is the skinny washi tape which I plan to use in my monthly planner. My main use of washi tape is in my journaling. It works well to stick down instax photographs. It adds some colour to my journal pages making them a great decorative tool. I have begun using washi tape to mark out holidays and long weekends in my monthly planner. It adds some decoration to the page and visually stands out against other diary entries. I often use washi tape to decorate notebook covers. Below you can see the sumo tape added to my current Baron Fig notebook. I have used some washi tape to make a decorative garland in my office after seeing a post from Tessa on some creative ways to use washi tape. I have used washi tape to decorate cards and brown packing wrap to make them look a little bit more exciting. My favourite washi tapes are stored on my desk round a pritt stick. This means they don’t take up too much room on the desk and it reminds me to use a number of different tapes. I have found washi tape really fun to use. The different designs and colours available is huge making this another dangerous stationery rabbit hole. I’d love to hear about ways that people use their washi tape, so please feel free to leave comments below.